It’s the most wonderful time of the year…Hanukkah is when you spend 8 nights eating fried foods, from jelly donuts to latkes. Before you start loosening your belt buckle and clogging your arteries lets talk about ways you can enjoy your oil, but in a healthier way. Traditional latkes are made with potatoes, onions, eggs, salt, flour and oil. To make it healthier I replace the potato with a more nutritious vegetable, like sweet potatoes, beets, carrots, parsnips, turnips, or celery root. Instead of flour, I use almond or coconut flour (which helps to bind, soak up excess moisture and adds protein). Instead of canola oil, I use avocado oil to fry. Omega 6 lies at the core of many epidemic diseases. Massive consumption of omega 6 from corn oil, canola oil, soybean oil, safflower and sunflower oil has caused an unhealthy balance in our diet. Also, these oils are GMOs (unless you buy an organic/non GMO brand). There are two properties of cooking oils that matter most:Smoke point (the temp at which the fats begin to break down and turn into smoke) and oxidative stability (how resistant the fats are to reacting with oxygen). The higher a fat’s smoke point, the more cooking methods you can use it for. Heated past its smoke point, that fat starts to break down, releasing free radicals. When it comes to frying latkes I like using avocado oil because its smoking point is between 400-500F. 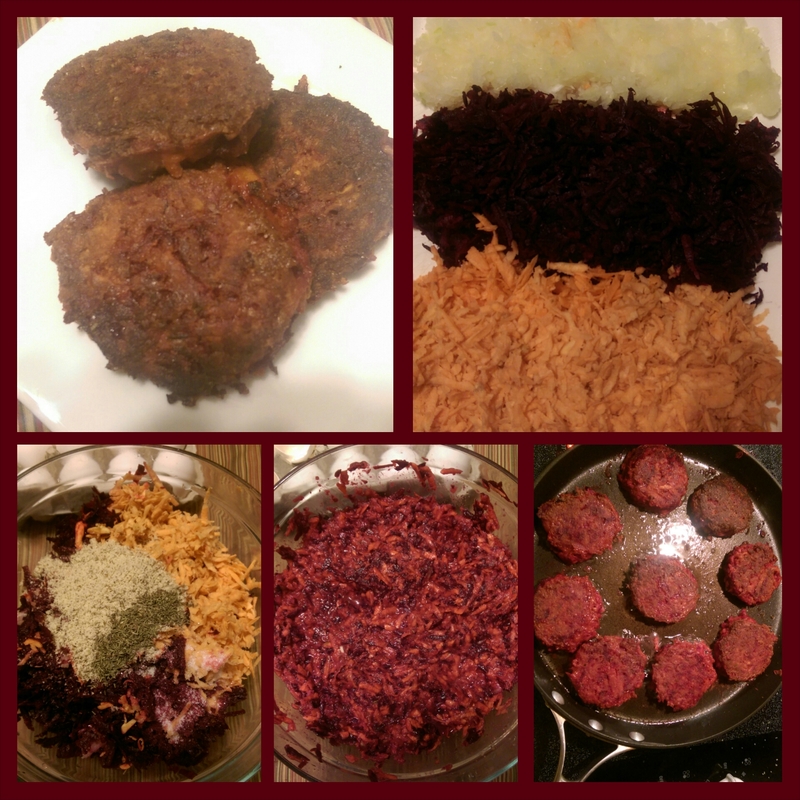 Hope you enjoy theses yummy and healthy latkes-Beet, sweet potato, thyme latkes and Curry, spaghetti squash latkes! 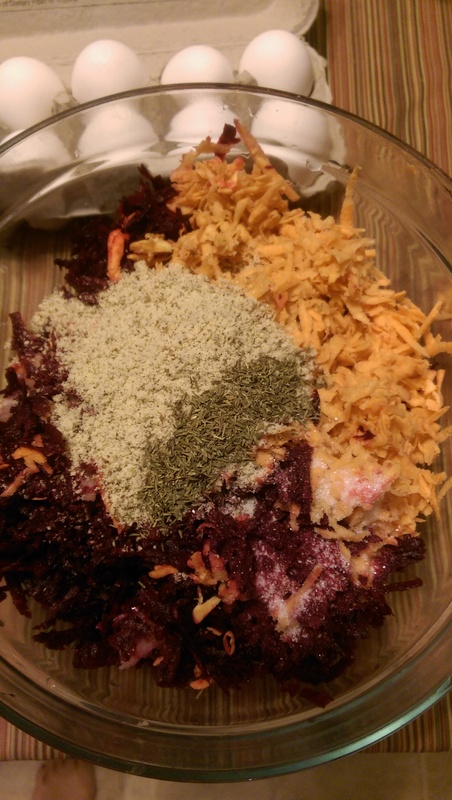 1) Grate the beets, sweet potato potato and onion in the food processor or with a grater. 2) Squeeze all the moisture you possibly can out of the grated vegetable. The onion will release the most moisture. Add the veggies to a mixing bowl. 3) Add the almond flour and rest of the ingredients to the veggies, and mix together with your hands. 4) Heat the oil in a skillet. 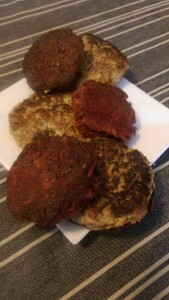 5) When the oil is hot, start grabbing handfuls of the veggie mixture and shape into patties, about 1/4 cup at a time. Gently drop a pattie into the oil, and flatten with a spatula. 6) Fry 3-4 minutes on each side, or until golden and crispy. Remove to baking sheet. Bake 20 min 350. Preheat the oven to 350F. 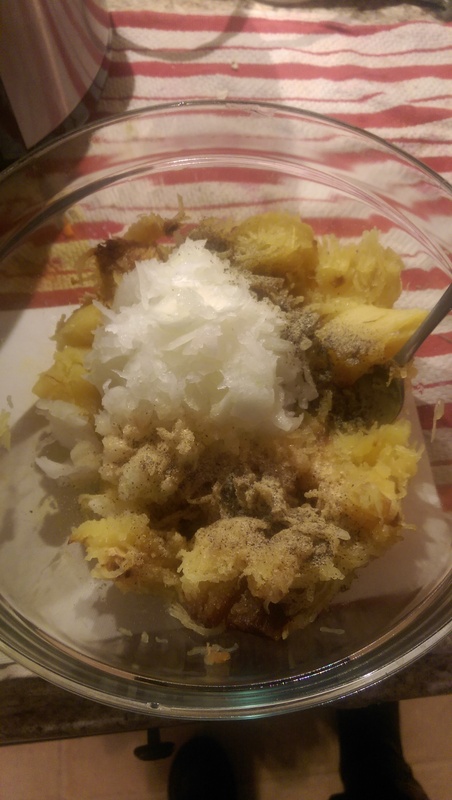 Slice your spaghetti squash in half. Scrape out the seeds. Place each half on baking pan. Bake in oven about 40-45 minutes. Let cool until you can handle it. Scrape out the squash strands with a fork. *To make vegan: For each egg in the recipe, make a flax egg: Mix 1 tablespoon of ground flax seeds with 3 tablespoons hot water, set aside for 3 minutes to thicken.